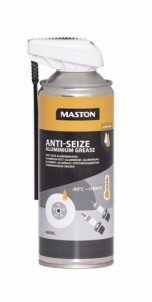 Maston Anti-Seize Spray is 100% synthetic lubricant. It is specially developed for extreme high temperature lubrication and high temperature damping. It is constantly stable at high pressure, reduces friction and prevents seizing in temperatures from -60 °C to +1100 °C. Excellent anticorrosion agent. Application areas: anti-seize for O2 / lambda sensors, brake parts, spark plugs, exhausts and muffler joints, clutches, bolts & nuts and sleeves. Eliminates squeal noise on disc and drum brakes, lubricates brake calipers, brake pistons and other moving parts. 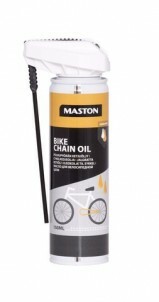 Maston chain oil is protective lubricant for bicycle chains. Penetrates the chain, reducing wear and tear caused by friction, lengthening the lifespan of the chain. Suitable for both amateur and professional use. 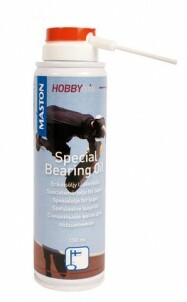 Maston Chain Oil effectively protects and lubricates chain and transmission gears. Suitable for example for industrial and agricultural wire cables, chains and conveyors. Thanks to its excellent penetrating power, also lubricates the innermost parts of a cables core, where the greatest loading takes place. Stays on well, without dripping or splashing. Reliable even in cold conditions, with ambient temperatures of -30 °C - +140 °C. 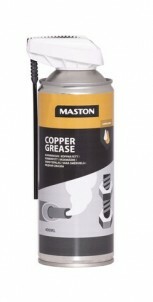 Used regularly, Maston Chain Oil helps to lengthen the useful life of the treated device. Instructions: Shake before use. Spray onto object to be treated. Leave to take effect for a moment before using the machine/device. Not suitable for O-Ring chain. 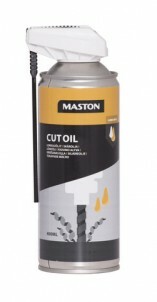 Maston Cut Oil is a friction-reducing cutting oil for metalworking. Allows steel and ferrous metals to be worked efficiently and economically. Also suitable for treating yellow metals and light alloys. Used in drilling, lathing, milling, thread cutting and sawing. How to do it: Spray onto object to be treated before working. Repeat treatment during longer working periods. Also available in 4 and 10 liter cans. Maston Lock oil is designed for oiling locks and hinges. Removes moisture. Prevents oxidation and freezing. 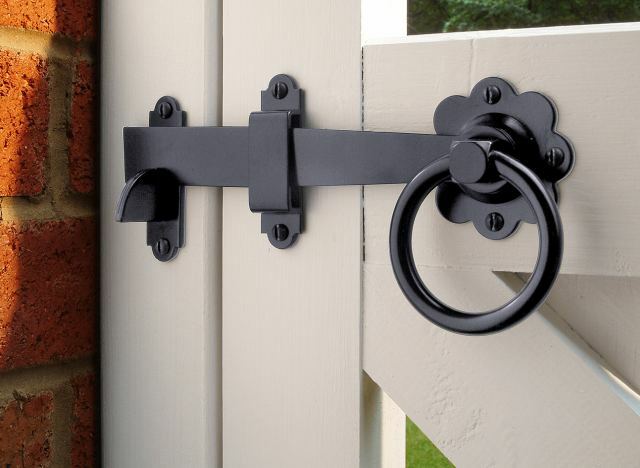 Lengthens the lifespan of locks and hinges. Frost resistance to -50 °C. 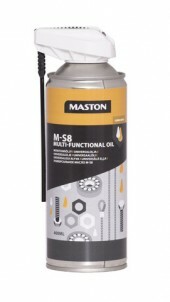 Maston M-S8 Multi-functional oil effectively fends off moisture and prevents problems with engine start ups caused by moisture build up in the separator. Easily oils the linkages, joints and cables. Also removes rust from seized bolts and the like. Helps to prevent circuit disruptions and oxidation in electrical equipment. Conforms to the requirements of Mil standards: Mil-C-16173E and Mil-C-22235. Shake before use. 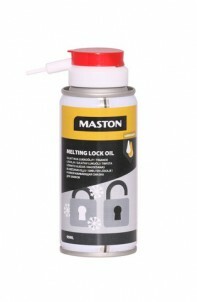 Maston Melting Lock Oil lubricates and melts locks and hinges. Effectively removes moisture. Also prevents the oxidation and freezing.